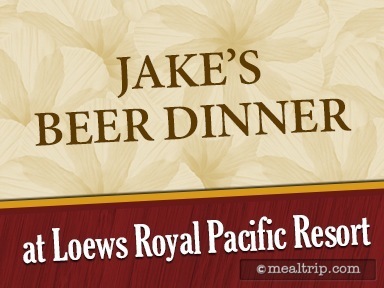 The Jake's Beer Dinner listing is a Special Event dining location at Loews Royal Pacific Resort featuring American, Wine, Beer, Spirits or Beverage-based cuisine. There are 48 photos in the Mealtrip photo gallery for this location and dining period. 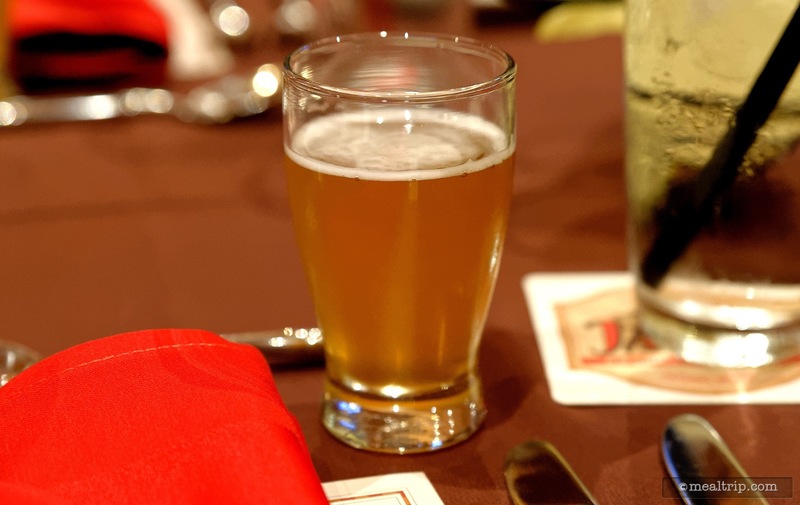 The Jake's Beer Dinner listing currently has a score of 82 out of 100. 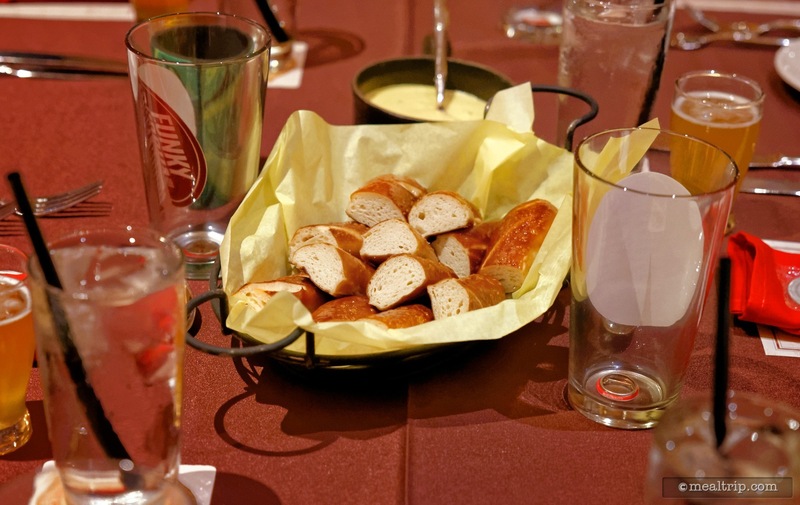 Click here to read all of the reviews for this location, or log in to Mealtrip.com to add your own review for Jake's Beer Dinner. 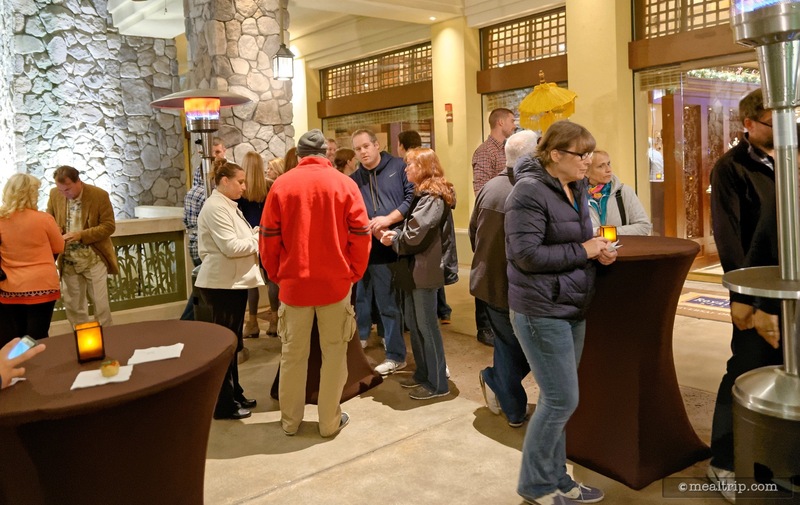 The reception area for Jake's Beer Dinner is located directly across from the front door of Jake's. 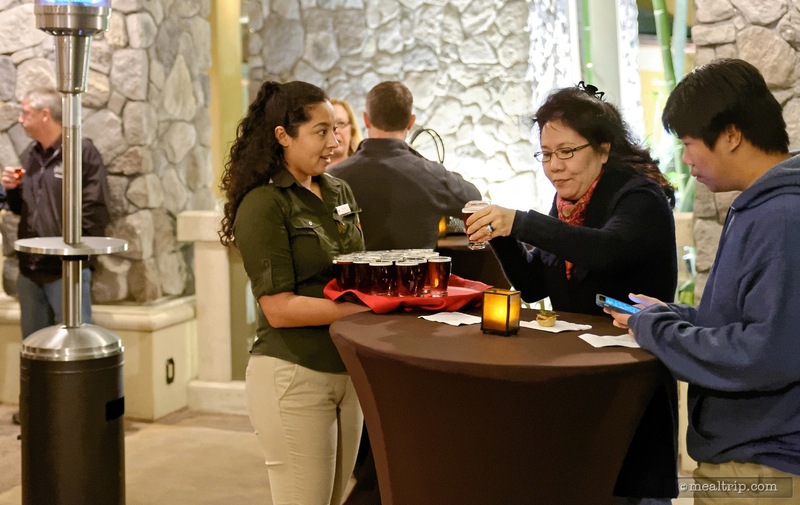 As guests start filling in the area, a complimentary "while you wait" beer is offered. 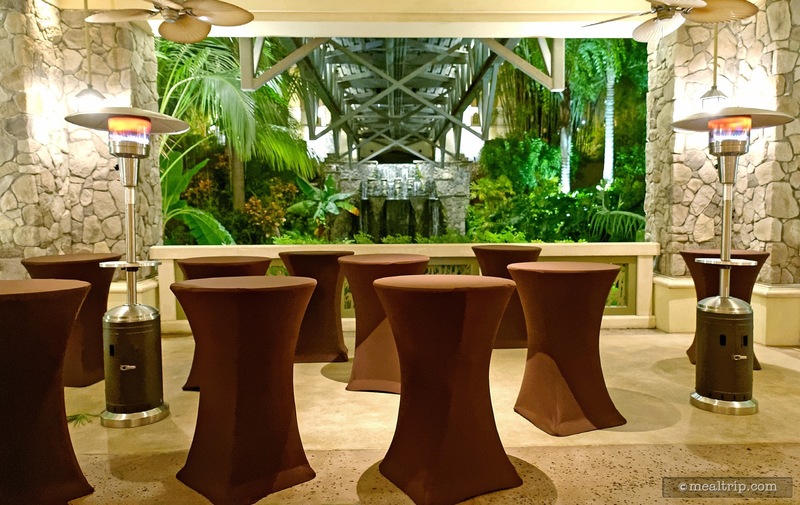 There are some "sit down" tables and chairs on either side of the reception area. 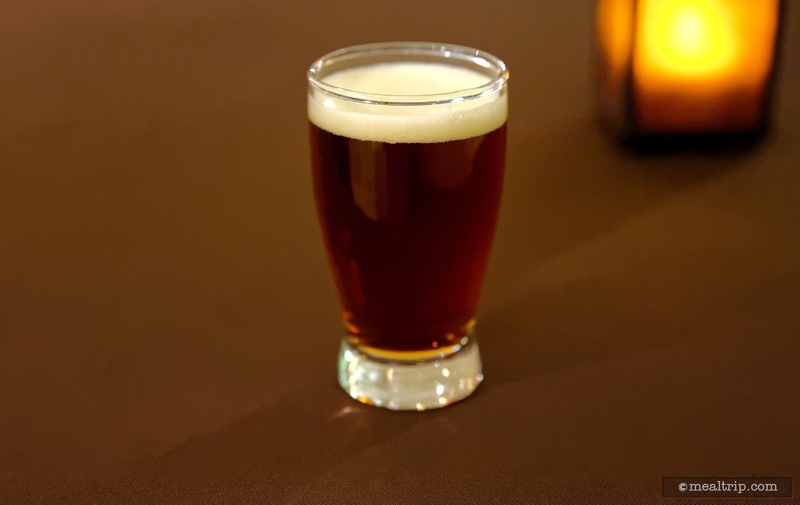 I can't 100% remember, but I'm pretty sure the welcome sample(s) were Jake's American Red Lager. Gathering a couple of beer samples before Jake's Beer Dinner begins. 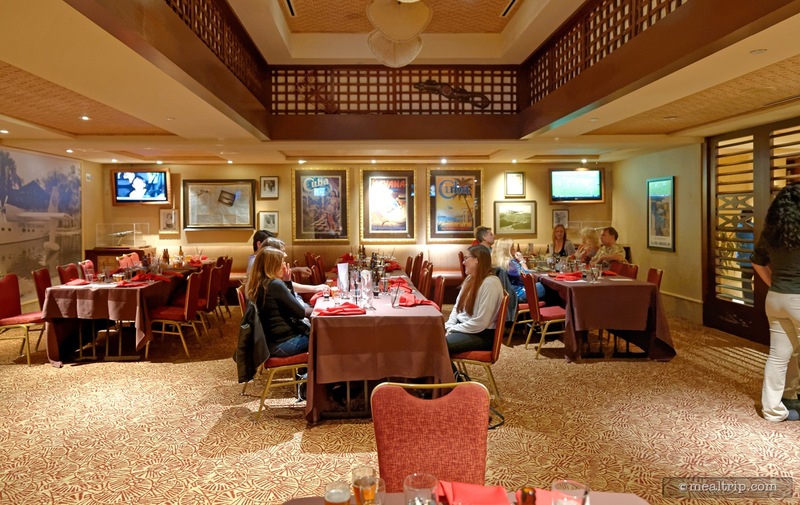 While the area doesn't look large, there seems to be ample space for everyone. 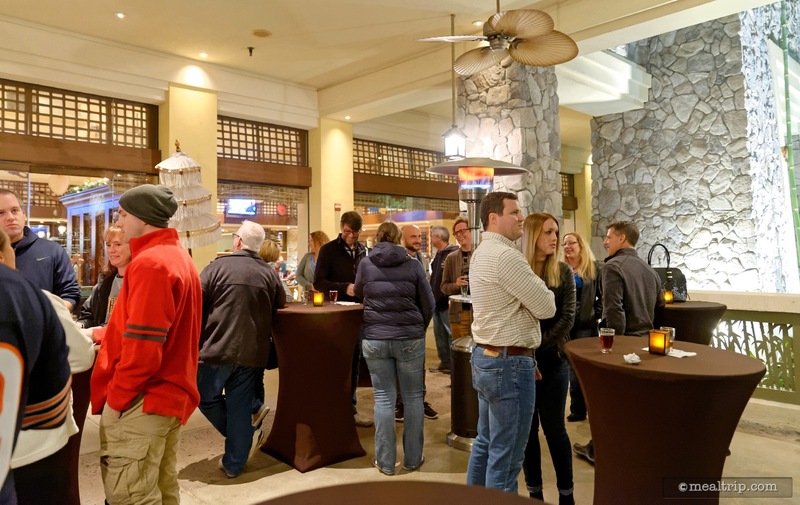 The event organizers start seating larger groups first, so you're really not waiting in the reception area for too long. 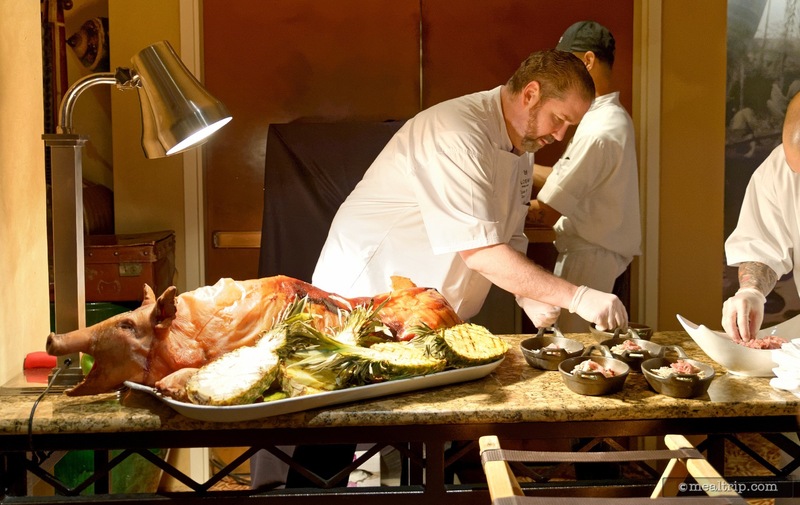 The reception area for Jake's Beer Dinner is not a bad place to wait because there are passed hors d'oeuvres! 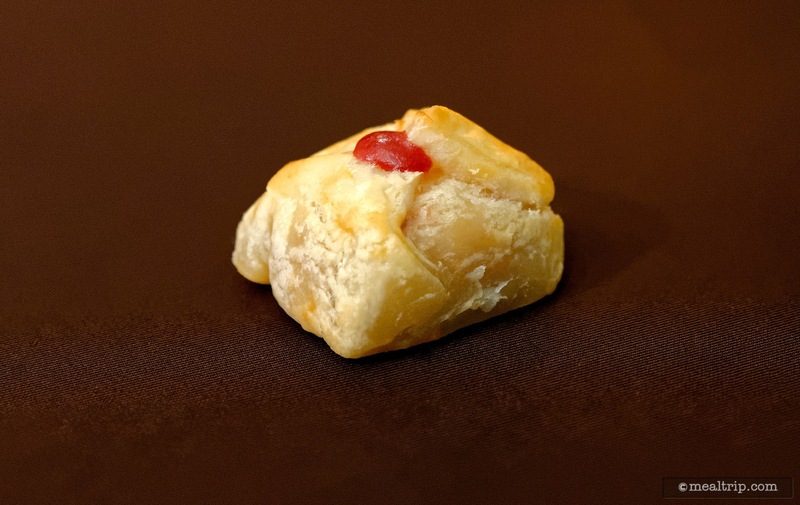 This little puff pastry was full of raspberry sauce, and paired really well with Jake's American Red Lager. 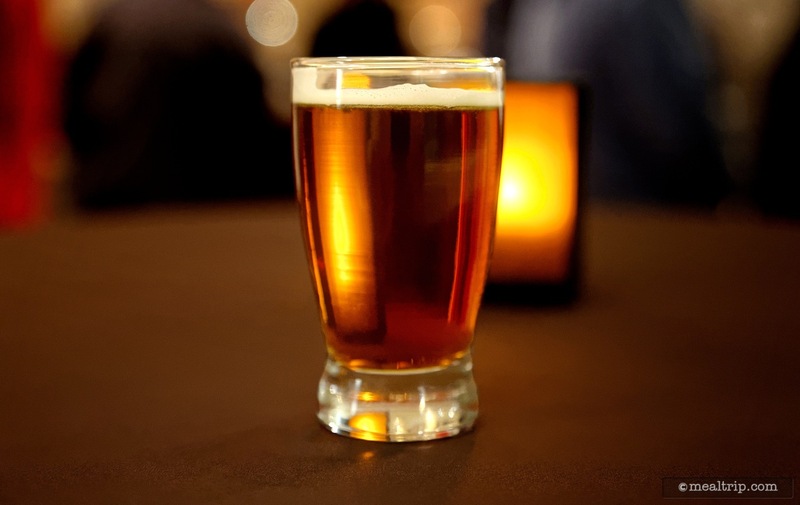 Pretty soon, a second sample of Jake's American Lager showed up. Why yes... I would like another sample. 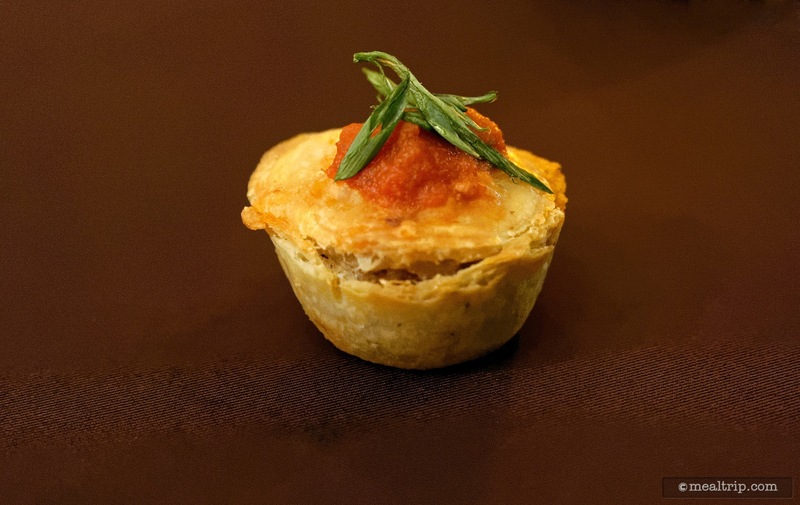 This little pastry was filled with tomatoes and basil. 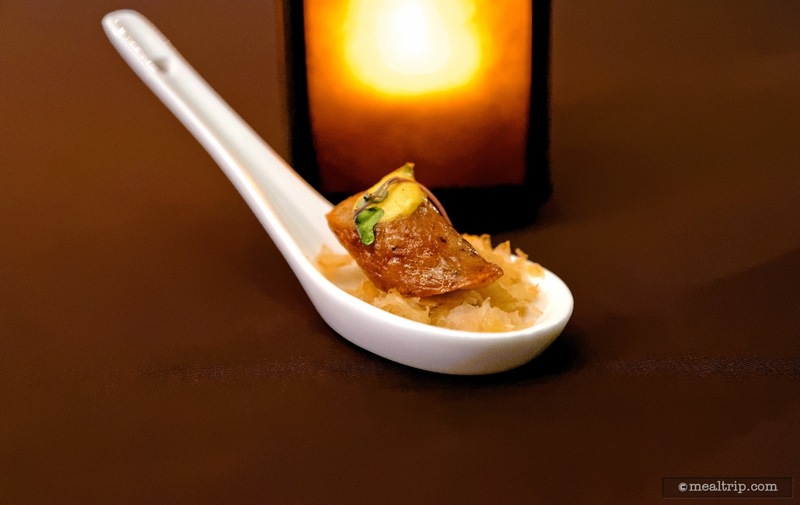 Another hors d'oeuvre at Jake's Beer Dinner (and this is all before the dinner begins), a small sausage on kraut with mustard! 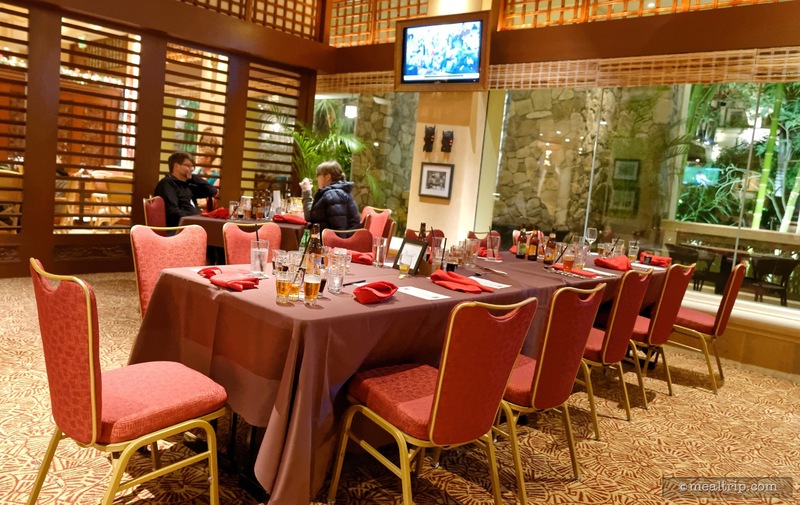 The Clipper Room at Jake's is a private event space. It's set up here to seat 60 (give or take) guests. Larger groups were seated first, to ensure their whole party was together. 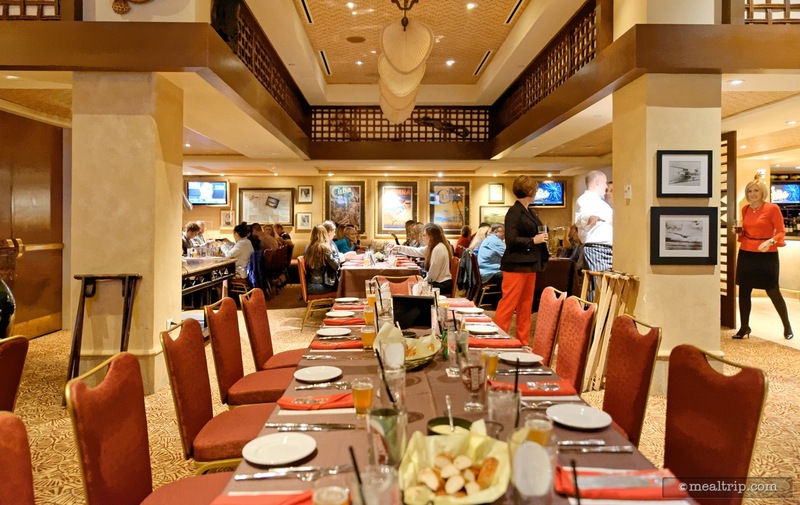 There is technically no "assigned seating" at Jake's Beer Dinner. 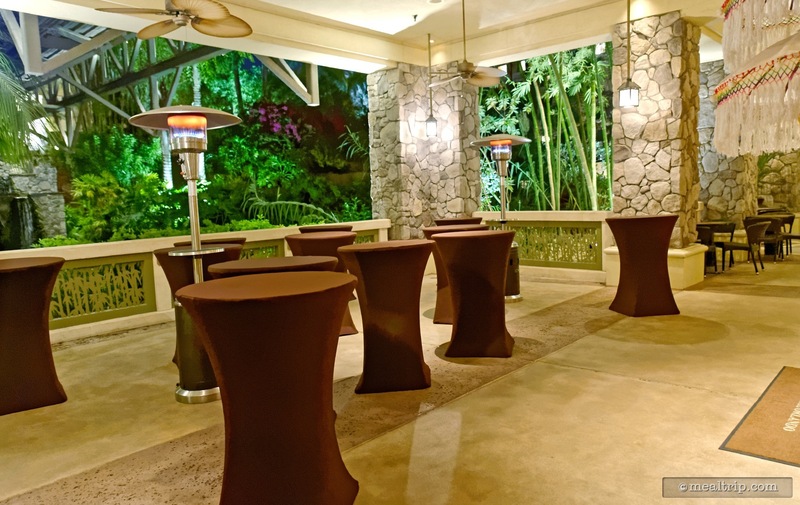 The tables were all set for large parties, so you will get to know some of the other guests. 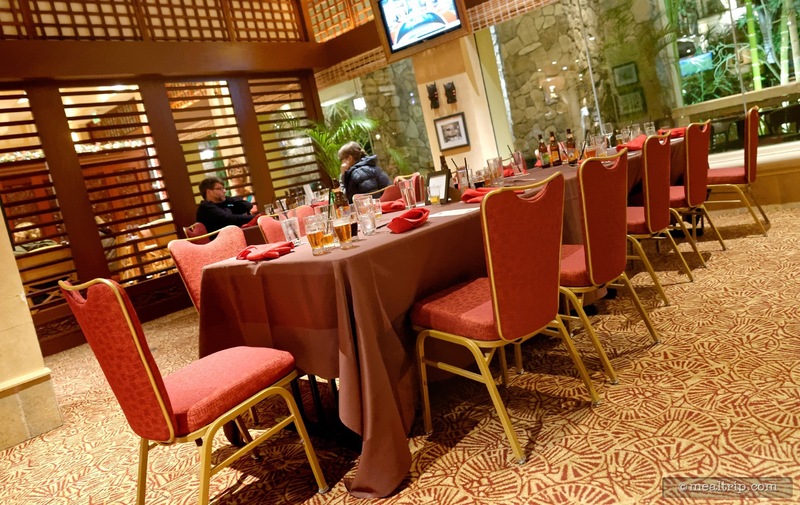 This table is set for 11 people. 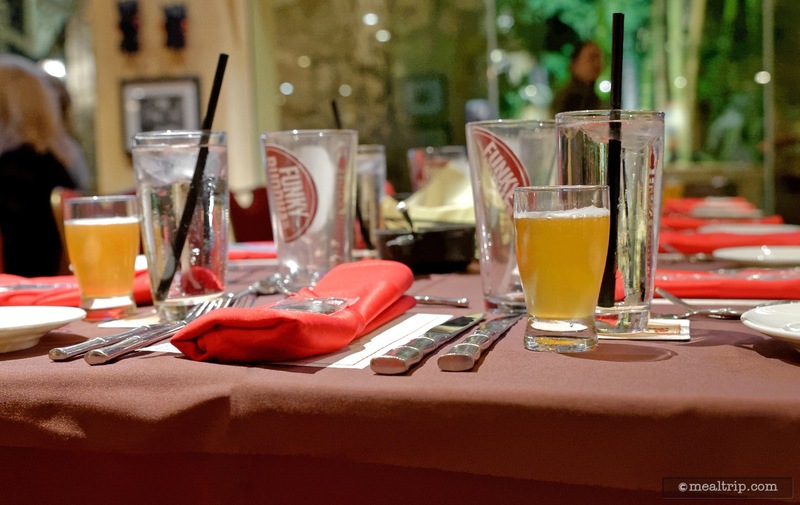 Sometimes an invited brewery will bring some take away items, such as a branded beer glass or bottle openers. 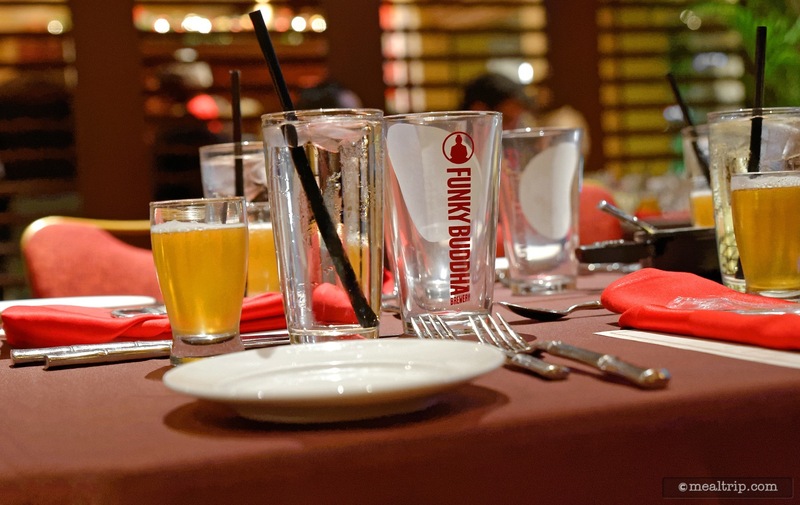 At the pictured event Funky Buddha had beer glasses at each table setting. 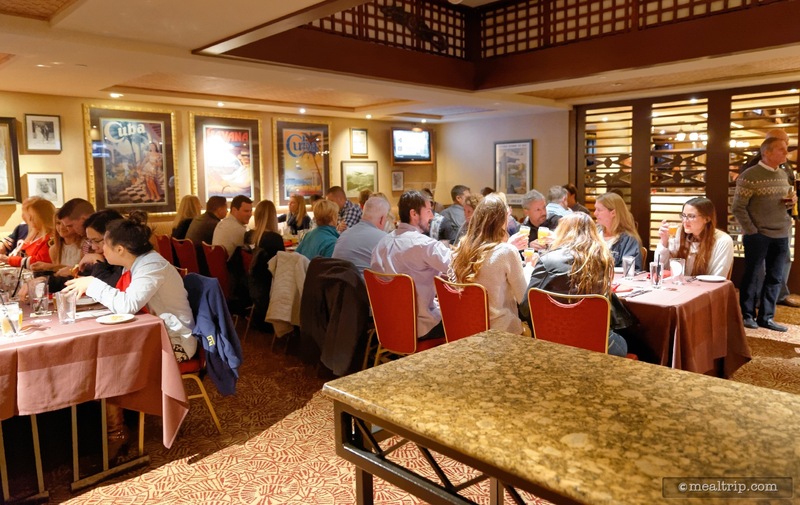 Another view of the large tables at Jake's Beer Dinner in the Clipper Room. 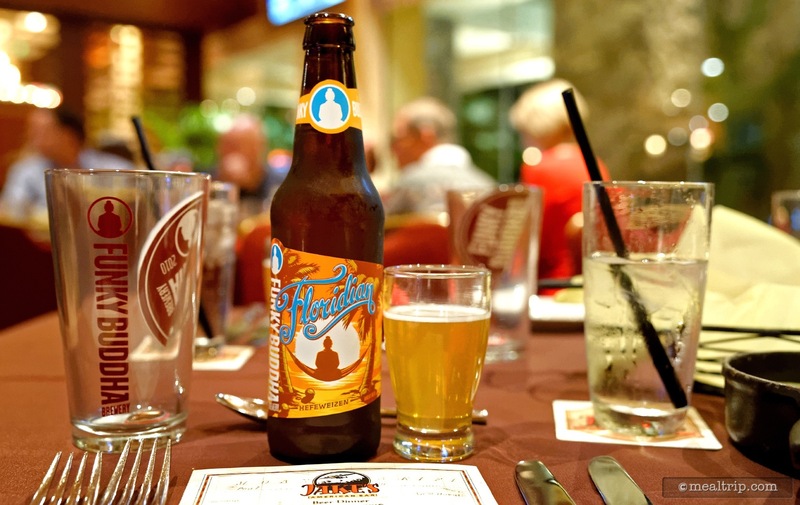 As guests entered, the first beer (Funky Buddha's Floridian) was already poured, along with a glass of ice water. 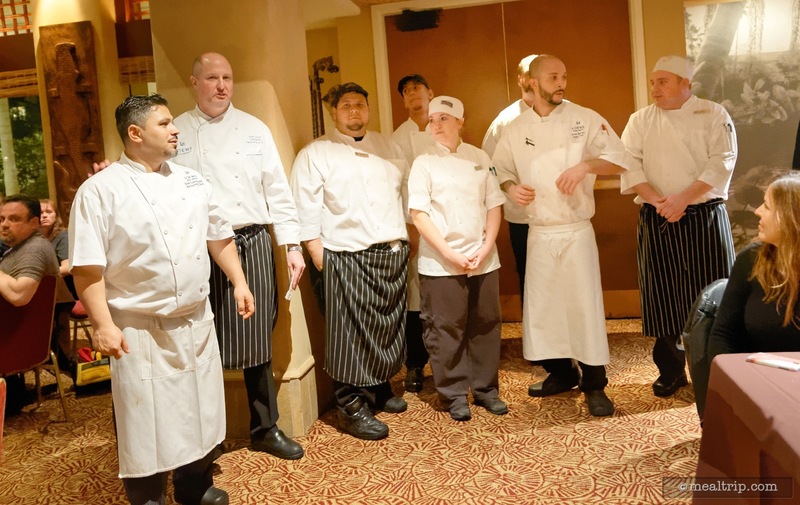 Everyone gets to know one another before Jake's Beer Dinner begins. 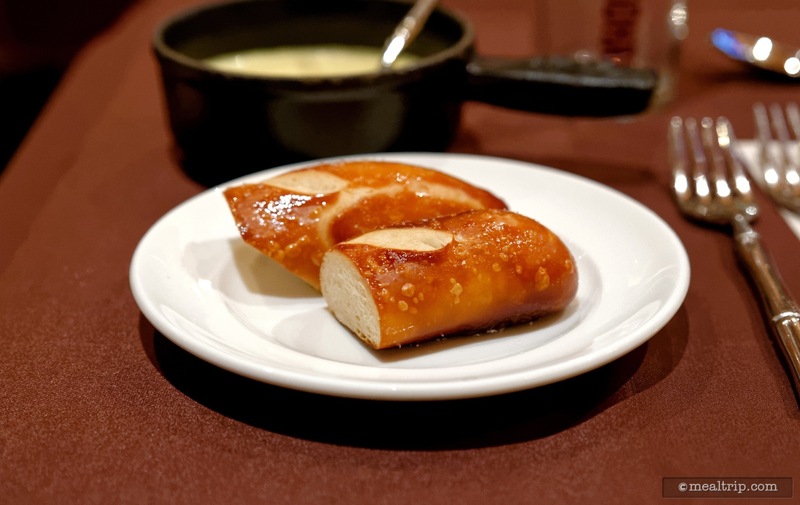 Here's a closer look at Jake's house made, warm, fresh pretzels. 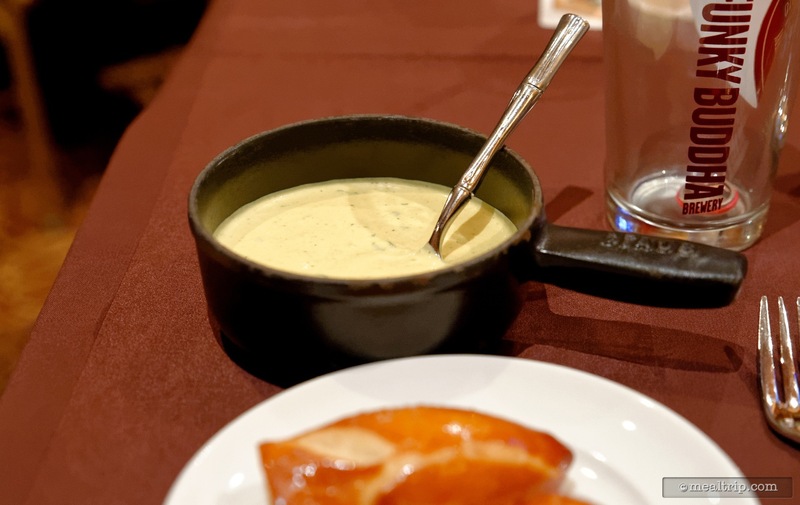 Also on the table are small pans of a warm dipping sauce. This wasn't "cheese" per say, but more like a sweet mustard. The "amuse" course beer for this Jake's Beer Dinner was Funky Buddha's Floridian. 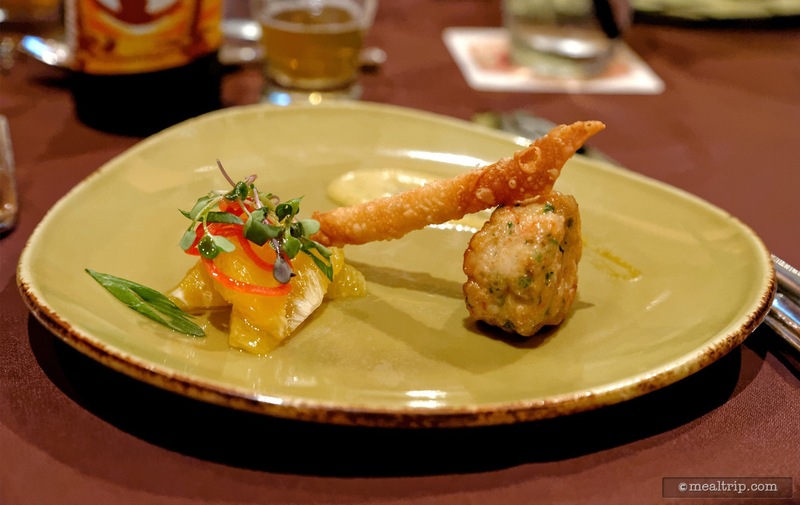 Funky Buddha's Floridian was paired with this "amuse" course, a Cape Canaveral Royal Red Shrimp Cake. 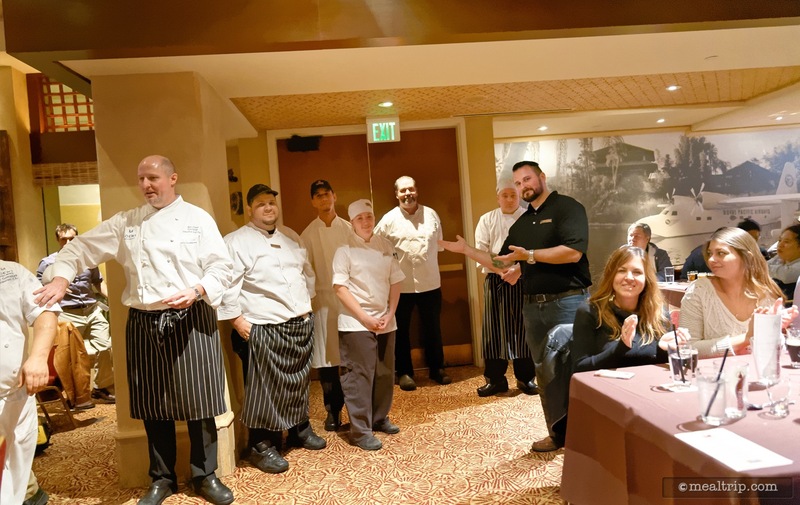 The chefs and brewery reps make appearances to introduce the courses and the reason behind the pairing. 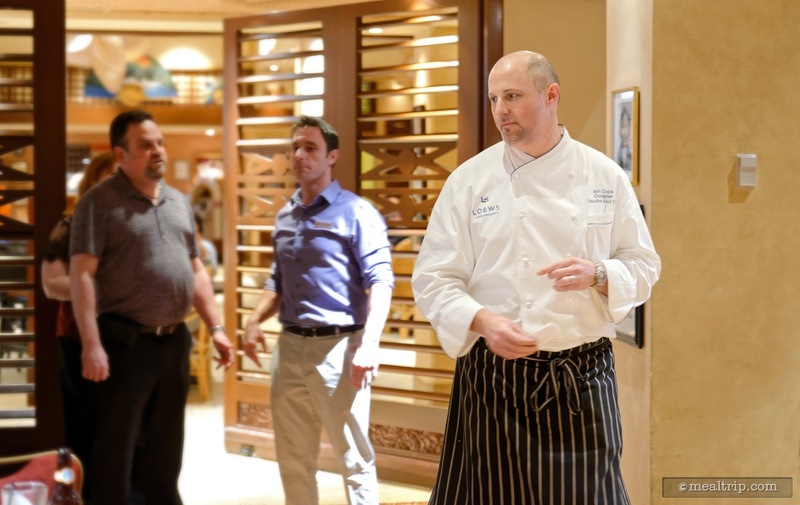 Pictured here is Ron Cope the Complex Executive Sous Chef at Loews Hotels. 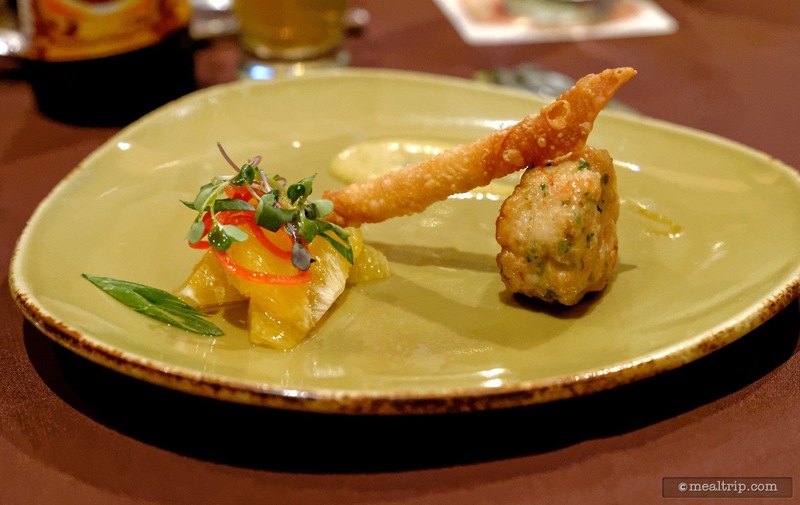 The "amuse" course for a recent Jake's Beer Dinner was this Cape Canaveral Royal Red Shrimp Cake with Florida Orange Salad and Sriracha Basil Tartar. 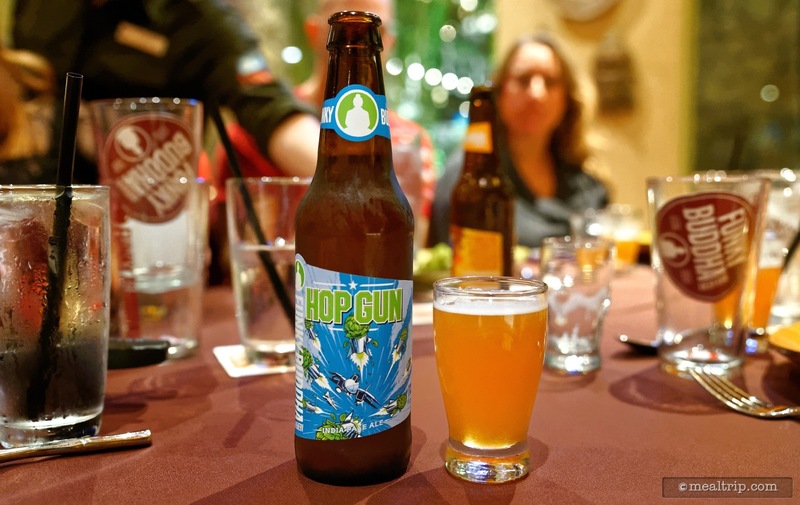 Our "first course beer" is Funky Buddha's Hop Gun IPA. 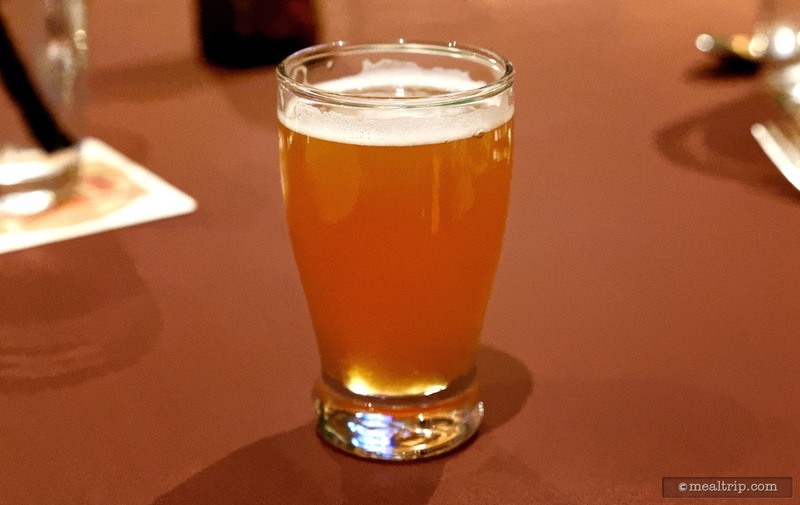 A closer look at Funky Buddha's Hop Gun IPA (ABV 7.0% / IBUS 60). 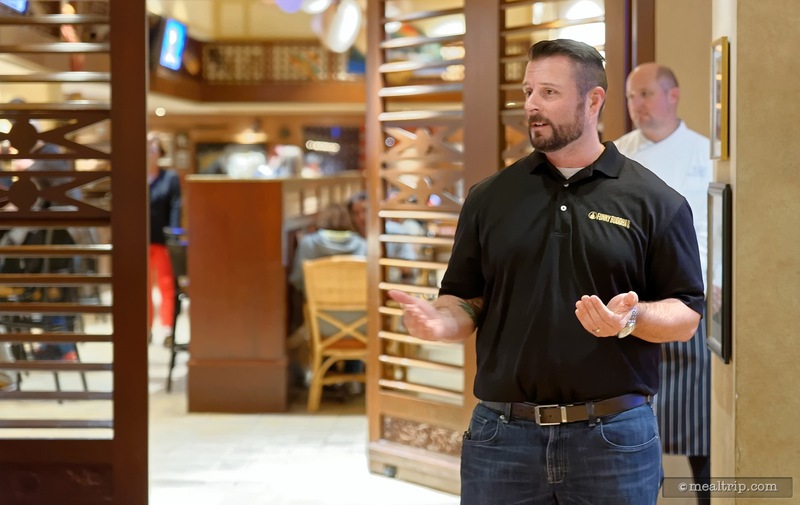 Jared W. Crowley is Funky Buddha's Central Florida Account Manager, and presented information about each beer as it was being poured at each table. 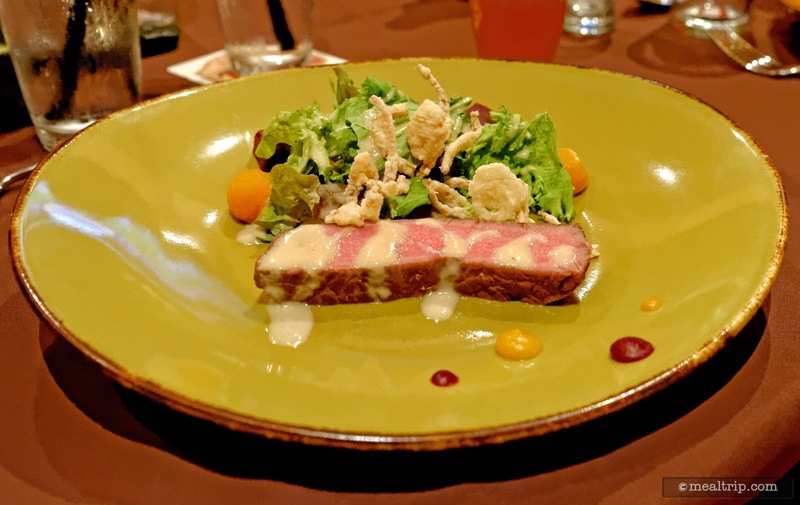 The first course was a Pan Seared Ribeye Steak Salad. It was paired with the "Hop Gun IPA" which contains a good amount of American hops. 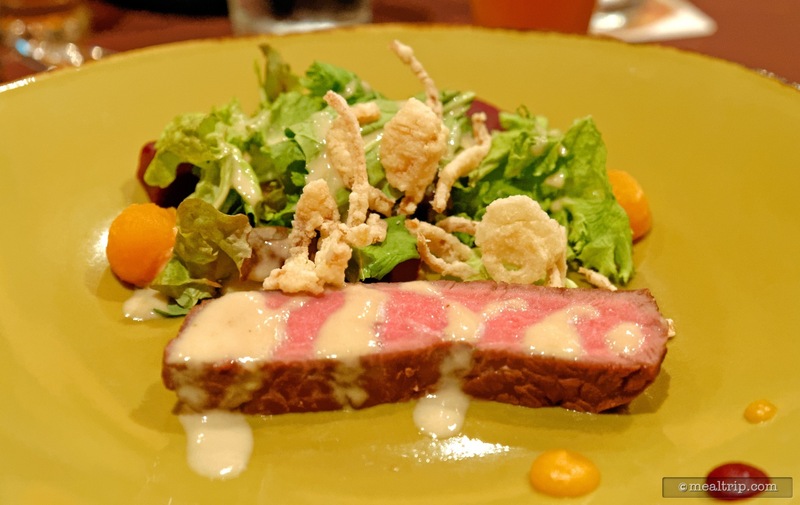 The Pan Seared Ribeye Steak Salad also featured Pickled Beets, Crispy Onions and a Horseradish Vinaigrette. 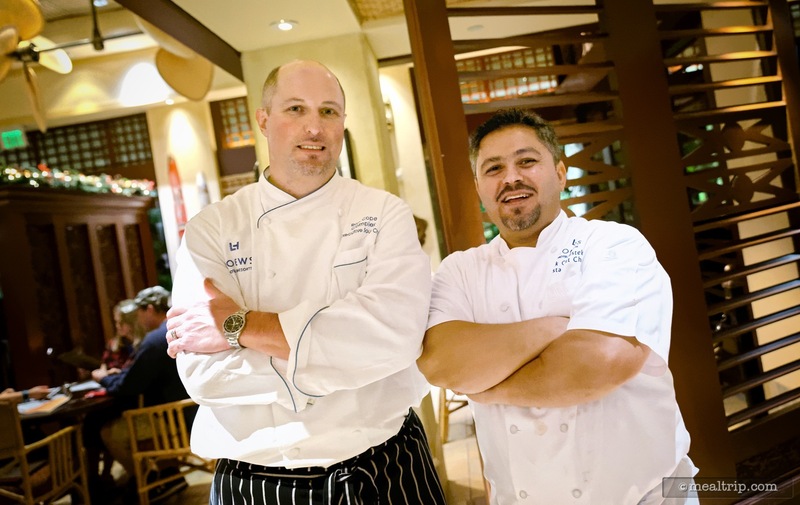 Chef Ron Cope and Chef Ufuk Gumustekin headed up the culinary team for a December 2016 Jake's Beer Festival. 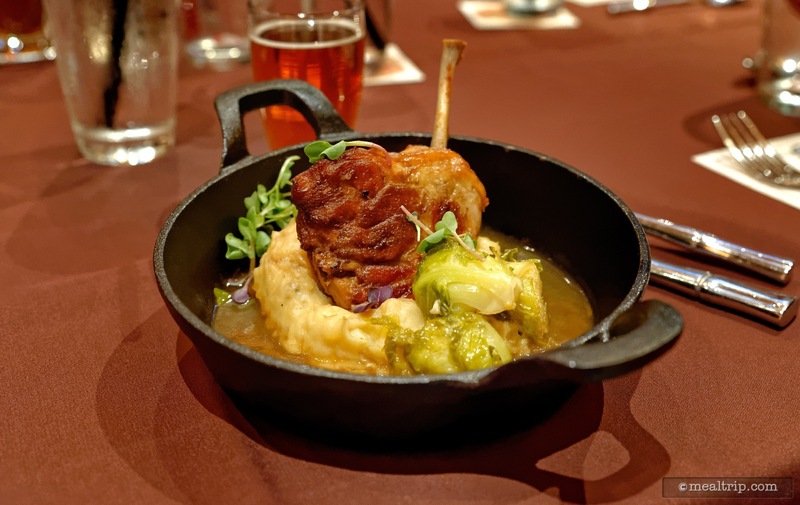 The second course was this Sweet Potato Beer Braised Duck Leg. 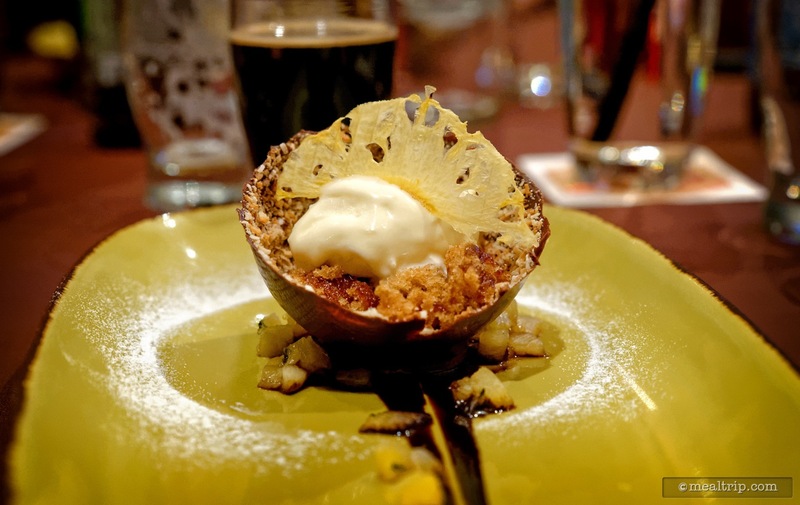 It was paired with Funky Buddha's Sweet Potato Casserole Beer (which is only available seasonally). 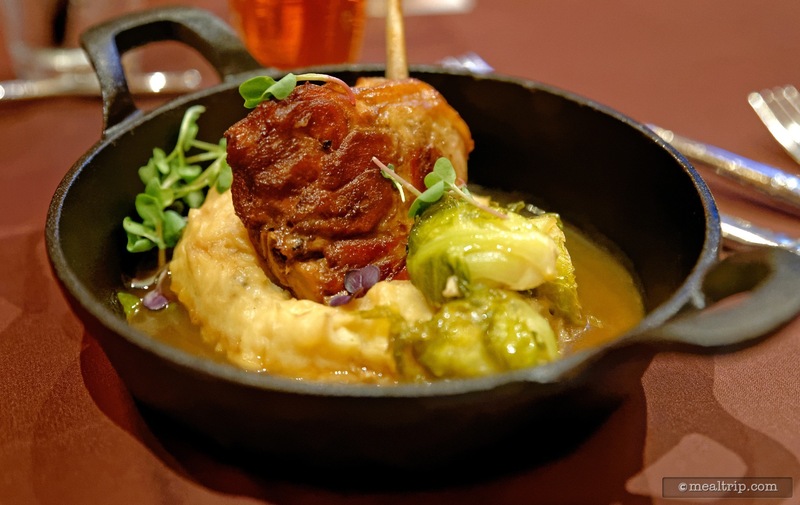 A closer look at the second course offering at Jake's Beer Dinner... a Sweet Potato Beer Braised Duck Leg with Dirty Mashed Potatoes, White Balsamic Glazed Brussels Sprouts and Sweet Beer a jus. 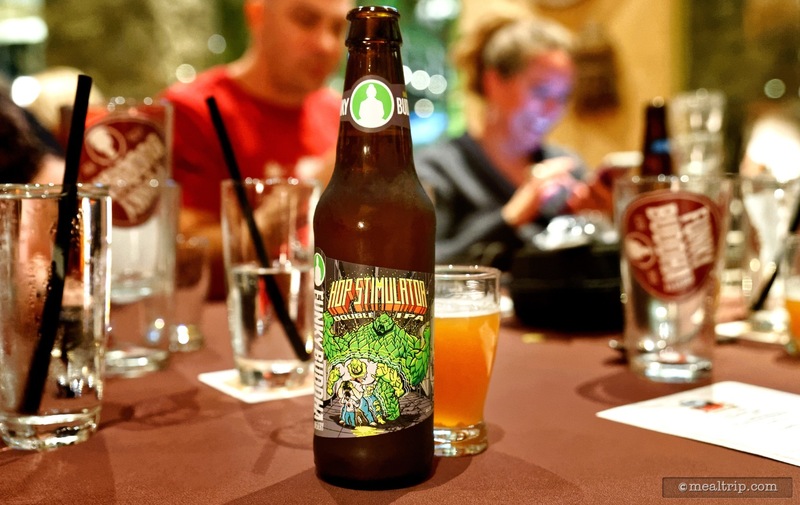 The third course at Jake's Beer Dinner featured Funky Buddha's Hop Stimulator Double IPA which has a bold all-malt body and an ABV of 9.5%, IBUS 75. 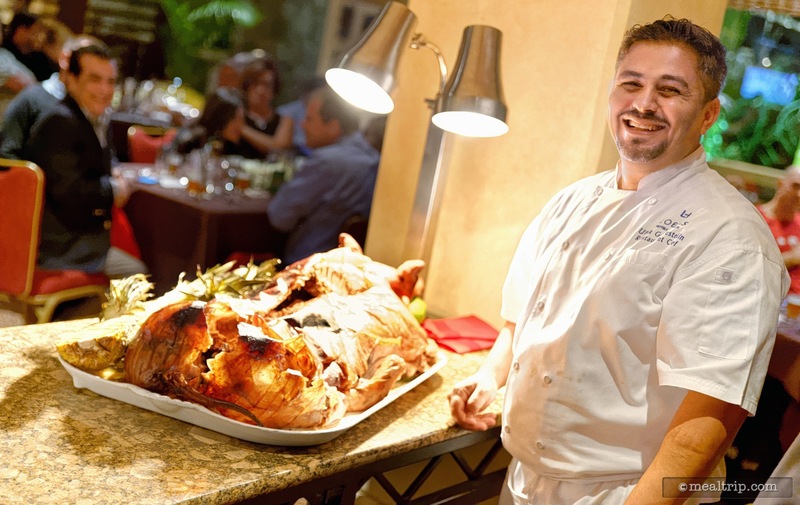 Yup, that's a whole roast pig that chef Ufuk Gumustekin has brought out from the kitchen. Hey you wanted farm-to-table... and pulling shredded pork right out of the pig... on-stage... is about as fresh as you're going to get! 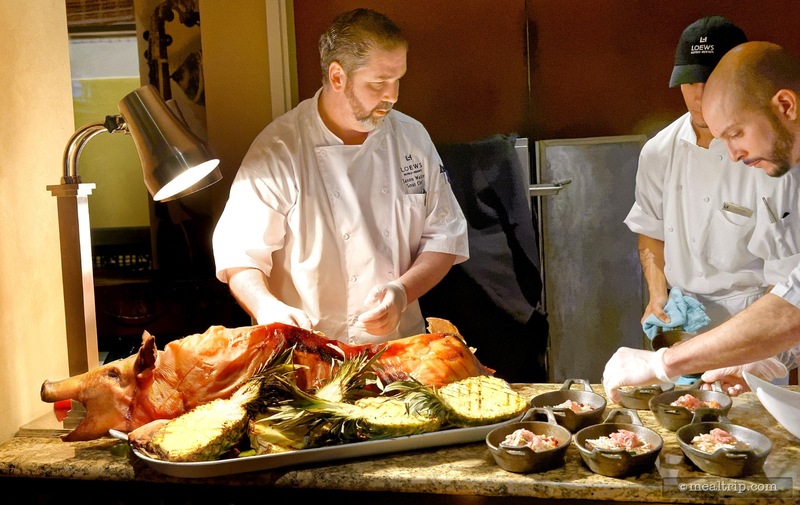 The roasted pork was added to the dish on-stage by three sous chefs and served right away. 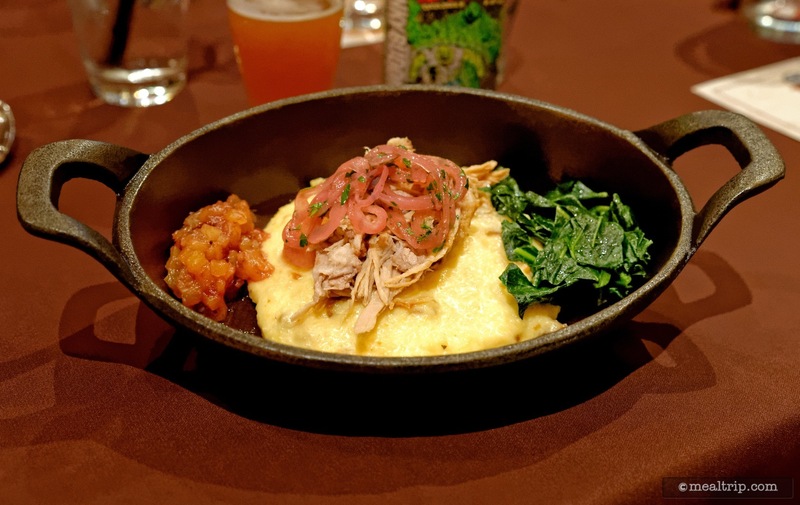 The pork was placed atop Creamy Pancetta Grits in a black skillet type of dish. 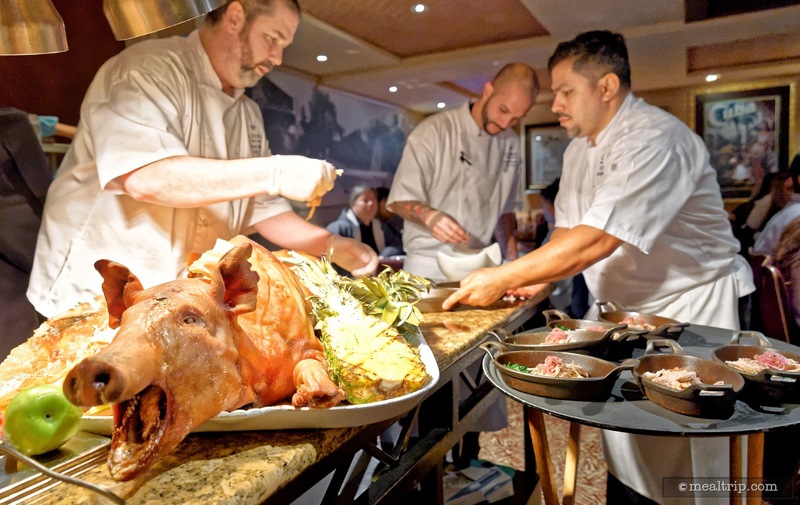 The Whole Roasted Pig course was one that everybody was looking forward to, and it did not disappoint. 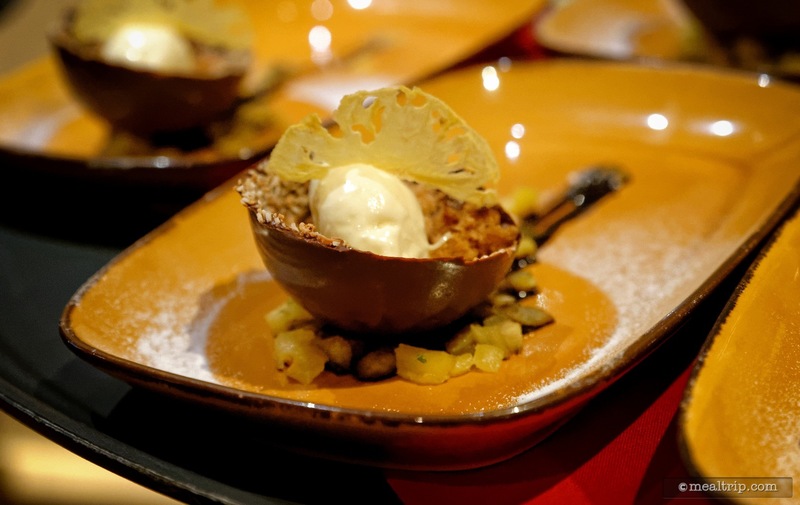 This third course was paired with Funky Buddha's Hop Stimulator Double IPA. 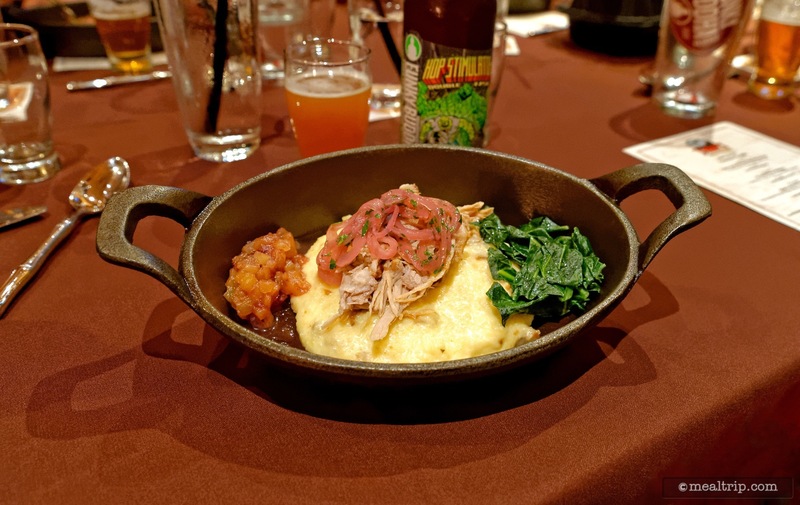 A closer look at the Whole Roasted Pig course features Creamy Pancetta Grits, Collard Greens, Pickled Red Onions and Cranberry-Pineapple Chutney. 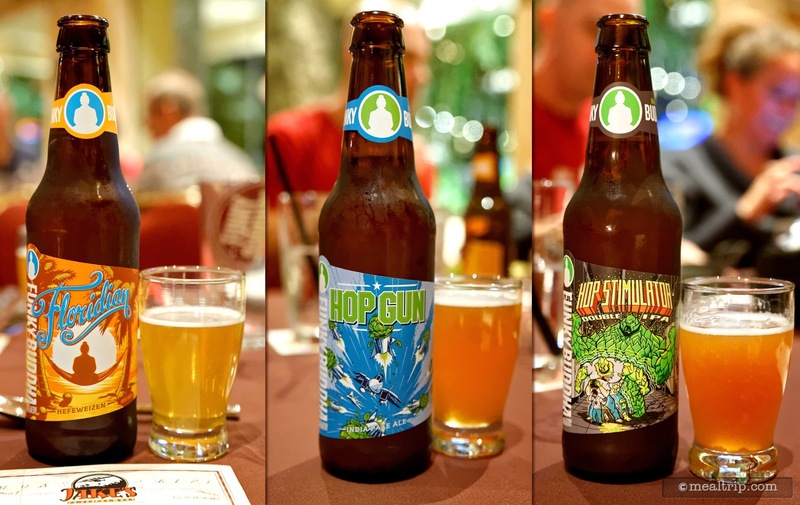 Here's a great shot of just three of the beers that Funky Buddha brought to a recent Jake's Beer Dinner... from left to right, the Floridian Hefeweizen, the Hop Gun IPA, and their Hop Stimulator Double IPA. The chef's and Funky Buddha's Account Manager all make an appearance before the dessert course. The fourth (dessert) and final course of the night, a Deconstructed Chocolate Pina Colada was paired with Funky Buddha's Last Snow Porter. 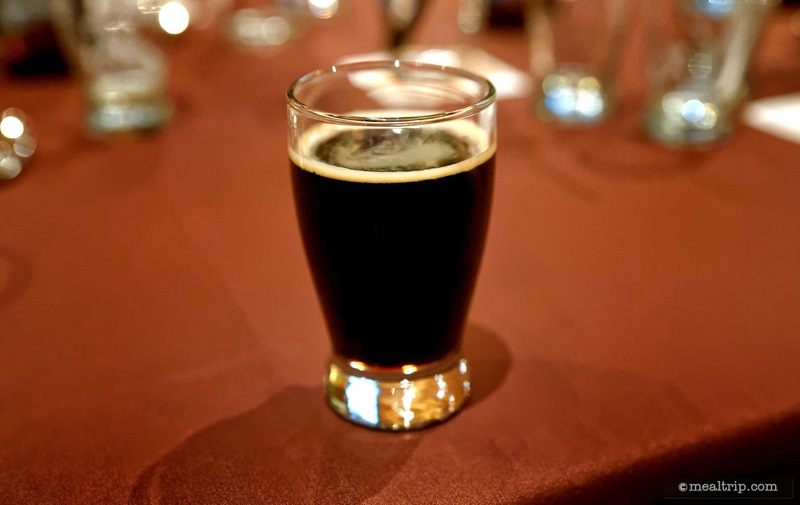 Funky Buddha's Last Snow Porter is a Porter with Coconut and Coffee. ABV 6.4% IBUS 35. 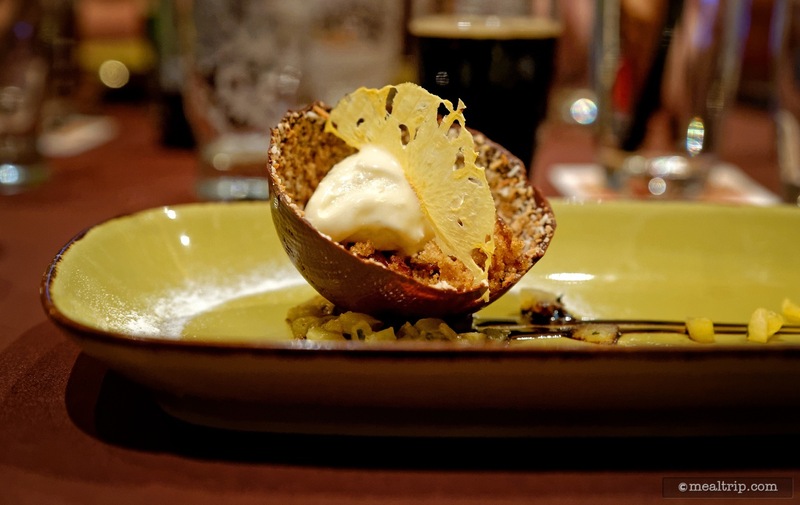 The fourth course's Deconstructed Chocolate Pina Colada was paired with the Funky Buddha Last Snow Porter. A closer look at the Deconstructed Chocolate Pina Colada reveals a Dark Chocolate Bowl, Ginger Spice Cake, Pineapple Compote, Coconut Ice Cream and Funky Buddha Last Snow Chocolate Sauce. 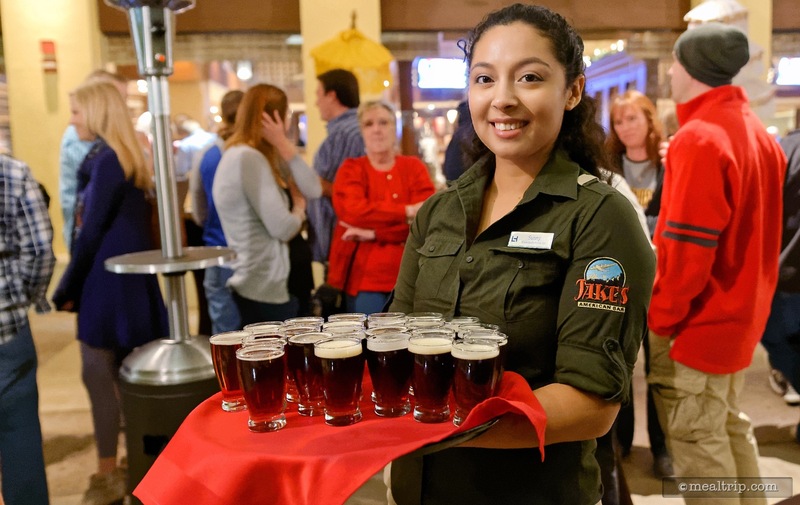 Thank you Jake's American Bar chef's for another amazing Jake's Beer Dinner event!